I cannot think of any relationship – personal or professional – that can exist or work without trust. Trust is the basis of every interaction and association and its importance should never be undermined and cannot be over-estimated. 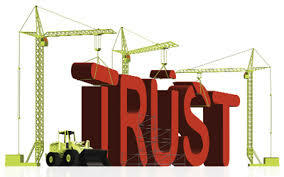 The other hard fact about trust is that it is built over time – consistently, patiently and through concerted effort. With this truth, there is a harsh reality too – trust is very easily broken and is almost impossible to re-build. Even the best intentions and long standing relationships are ruined if either side fails to make an effort to build and sustain trust. Let us first look at why people lose trust either in professional associations or in personal relationships. There are always reasons which if not checked can pose serious challenges to the sustenance and re-building of trust. Many times a breakdown of trust is often caused by simple miscommunication and set patterns of thinking. A perception or bias sometimes too can be the cause of breakdown in communication leading to people being alienated from each other. Sadly very often there are people who do take advantage of another person’s good nature and deep trust and use the relationship for personal gains thereby betraying the trust of the person. It is no wonder then that outside of families and sometimes within, relationships have become increasingly strained, limited and short-lived. I find people trusting each other a lot less and eyeing each other with suspicion seems to have become the norm. What do you think are some ways to build and sustain trust? Do you use these methods in your everyday life? In my experience building and sustaining trust does take time but is worth every minute spent. When you communicate with anyone, speak clearly and without prejudice or bias. State your intentions and ensure that the words used, body language exhibited and the way you speak are all cohesively linked and support each other. Speak about yourself first before expecting the other to trust you with personal information especially if you are the one seeking to build a relationship. Professionally, ensure that what you say clearly defines your goal and the intended outcomes of the association and what can each party gain from it. If you are the party making the engagement effort, ensure that your communication is clear, honesty and free from ambiguity. Trust built at this stage will forge a stronger relationship that can be strengthened and energized over time. Whatever the relationship or association, familiarity must never lead to disrespect or taking the other person for granted. Mutual respect fosters trust – seems obvious right? However, more often than not as relationships progress people begin to take situations and the people involved for granted thereby losing trust and confidence in each other. Mistakes happen as no one is perfect. The best way to keep trust even in the face of a mistake is taking ownership of it and offering an unfeigned apology and a promise that the mistake will not be repeated. This is applicable to any relationship – personal or professional. Many relationships fail simply because the people involved refuse to accept their mistakes and the human ego takes over instead. However, a very crucial aspect of trust is that a person must trust oneself first. Without trust in one’s own capabilities – emotional, physical, spiritual and even financial – it is, in my opinion, impossible to trust another. Are you capable of trust?